Volvo C30 (M) 1.6 Coilover Kit (GF67-015) - AP Coilovers - Suspension Direct. AP Coilover suspension kits are designed and manufactured in the heart of Germany by one of the most prestigious and well know suspension brands. The AP Suspension range has a full list of applications from many of the largest motor manufacturers such as Alfa Romeo, Audi, BMW, Citroen, Fiat, Ford, Honda, Mazda, Mercedes, New Mini, Peugeot, Renault, Seat, Skoda, Subaru, Suzuki, Toyota, Vauxhall / Opel, Volkswagen and Volvo. The AP suspension range not only includes the very popular Coilovers but Lowering Springs, Shock Absorber and Dampers. A keen Pricing structure for the AP Coilovers range is the main attraction for the customer. Some imported far eastern sourced kits can have a lower price but the German TUV quality manufacture process and warranty system allows for total quality and a full 2 year Euro warranty. We believe that each and every AP Coilover suspension kit offers the highest quality for the money and pound for pound the AP Coilover range cannot be beaten for a cheap suspension kit. What is AP Coilover Suspension? 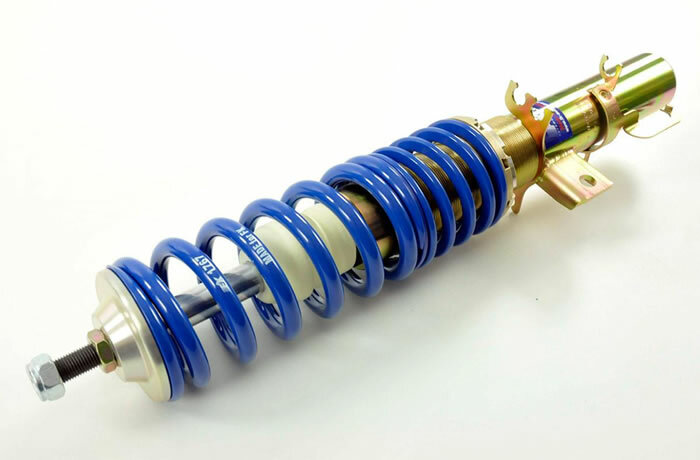 Historically coil over suspension has been used for high end performance cars and racing cars. It features a spring that can be adjusted via a rotating threaded collar that moves the base of the performance spring lower or higher to optimise the ride height. This will improve the handling and with the addition of a 25-30% stiffer fixed rate damper the AP Coilover suspension system will firm up the ride quality. This adjustable lowering feature of the AP Coil Over system can be moved from 30mm to a maximum of 90mm (depending on application). Can I lower the AP Coilover Suspension system myself? Yes very easily, it is as simple as jacking the car into the air letting the weight off the wheels then turning the adjustable blue coloured collar or platform as is referred to. When lifting the AP coilover platform up the height of the car will be raised, when lowering the AP coilover down, the height of the car will lower. How will it affect the handling? The car will feel stiffer to driver and more planted to the road, it will react more positively to steering inputs and will suffer less body roll in the all too important twisty bits. AP Coilover suspension systems are not a full on harsh track / race suspension kit they are designed to maintain a good quality of comfort whilst uprating and delivering a true sporting ride. Front and rear axle with threaded height adjustment.